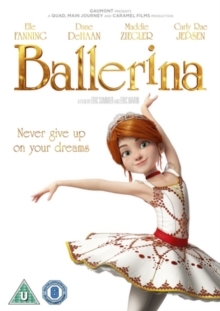 Children's animation that follows an aspiring ballet dancer in France and features the voice talents of Elle Fanning, Dane DeHaan and Carly Rae Jepsen. In 1879, poor orphan Félicie Milliner (Fanning) leaves her orphanage in Brittany with her best friend Victor (DeHaan) and moves to Paris where she dreams of becoming a professional ballerina. She enrols as a ballet pupil at the Paris Opera and is taken in by its kind caretaker Odette (Jepsen) but despite trying to achieve her dreams Félicie finds life tough at her prestigious and competitive dance school. With the help and support of Victor and Odette, will Félicie be able to realise her dreams in the big city?